Recordings suggest that there are possible nesting populations of Newell’s Shearwaters and Hawaiian Petrels on Oahu. The latest update of the IUCN Red List reports that 222 bird species are critically endangered. Audubon has a guide to identifying Greater and Lesser Scaup. The Great Black Hawk in Maine was taken to a wildlife rehabilitation facility after it was found unresponsive with frostbite. The bird is recovering, but there are now questions about what to do with it once it is healed. Scientists have mapped the genomes of three Caribbean parrot species — the Puerto Rican Parrot, Cuban Parrot and Hispaniolan Parrot — to assist with conservation efforts. Project SNOWstorm is looking for photos of wintering Snowy Owls to aid identification of individuals. This year's Christmas Bird Count might have been the last in parts of Bentsen-Rio Grande Valley State Park and the National Butterfly Center if the border wall is built as planned. David Sibley explains why the presence or absence of an eye-ring is useful for identification. Mockingbirds that have been exposed to lead tend to be more aggressive. Mercury pollution also affects birds by raising their metabolism. A New York state legislator is writing a bill to require new construction projects to include features to make the buildings safer for birds. Increased water flow to the Colorado River Delta has increased bird abundance by 20% and bird diversity by 42%. At least 94 animal species have been documented preying on the nests of Australian birds; among those, the Pied Currawong is known to prey on the most different bird species. West Nile Virus is still active and was detected in Ruffed Grouse in Wisconsin. Birds can carry fungi along with the plants they grow on. This year's Great Backyard Bird Count is February 15-18, 2019. See here for details. 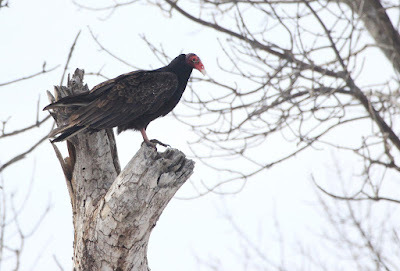 10,000 Birds: Maine's Great Black Hawk - Rescued! A recent accident highlighted the weirdness of hagfish and the slime they produce. A paper notes the difficulty using photographs to identify members of the genus Lynx. A contagious cancer has killed 80% of the wild Tasmanian Devil population, but a new study suggests that it will not cause extinction. Evolution of new species moves the fastest around Antarctica, where the conditions are constantly changing. Bringing wildlife back into cities can start with providing green spaces that attract insects, including rooftop gardens or green roofs. Some wasps have enlarged lower legs to help with balance. A warmer climate might lead to plants absorbing less carbon dioxide because of the increased risk of drought. A triage approach can help planners decide how to adapt to climate change, but governments still need to budget enough to carry through with adaptation. The importance of the climate change problem tends to be underreported, even as communities are forced to move or disasters strike. Because it is an El Niño year, atmospheric carbon dioxide is expected to rise more this year than it did last year. Parts of Grand Staircase-Escalante National Monument are now available for mining, but it remains to be seen if mining will actually happen. Protests and corruption investigations stopped a series of dams along the Marañón River between Peru and Brazil that would have resulted in an environmental disaster. A bill in the NJ Assembly would protect Liberty State Park from further development schemes.